We Have Halted the Salmon's Decline - SOTSP. Since the Spirit of the Salmon Plan was formulated, the tribes, the region, and our country’s and Canada’s leaders have worked together to halt the general trend of declines in total upriver salmon (and steelhead) returns, particularly after some very low years in the mid-1990s. The figures below and adjacent show the turnaround beginning in 2001, except for steelhead and coho stocks. Upriver spring chinook had record returns in 2001; upper Columbia summer chinook in 2002; sockeye in 2012; and fall chinook in 2013. While this is a real improvement, overall upriver salmon runs remain less than 2 million and far short of the 4 million Spirit of the Salmon goal. For individual salmon populations, the picture is varied and indicates that some stocks may still be declining. A discussion of population trends for the Columbia’s upriver stocks is presented in Abundance Trends. Data and trend lines in RED are prior to 1995. GREEN represents data and trends after 1995 (the year the tribes began implementing Wy-Kan-Ush-Mi Wa-Kish-Wit). 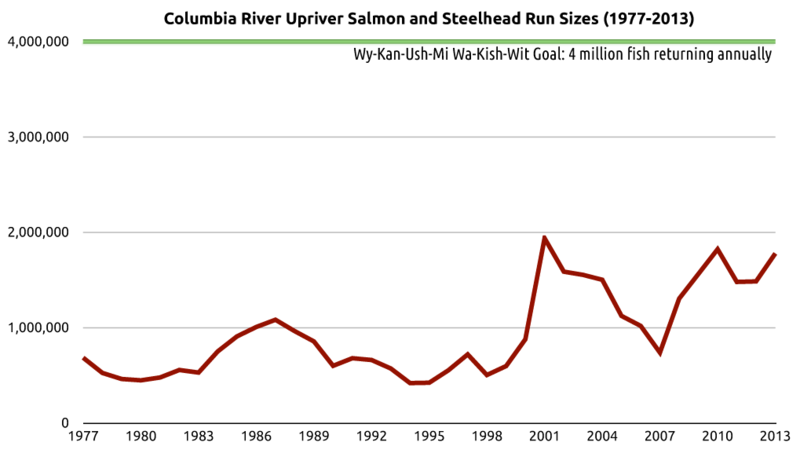 Since 1995, the overall decline of Columbia River salmon has been halted.